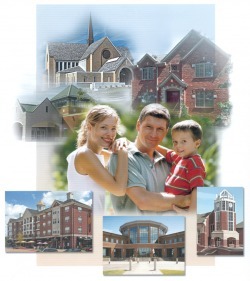 enhances the value of your community now and in the future! Homes and businesses built with durable masonry materials reflect commitment to long-term, managed stability. Built to last and requiring little maintenance, masonry structures help set a community’s legacy for generations. Masonry doesn’t burn. Made from fire, it is naturally fireproof. Masonry is solid and sturdy enabling structures to better withstand weather forces. Masonry materials are also more resistant to blast and impact damage. From classic to modern, masonry structures reflect beauty with their vast array of colors, textures, and shapes. Buildings designed using masonry materials age gracefully and create attractive neighborhoods and cityscapes. Masonry structures hold their value over time, which strengthens a community’s tax base and can raise its bond rating. Masonry materials can be used to improve overall energy efficiency helping to make buildings more sustainable.